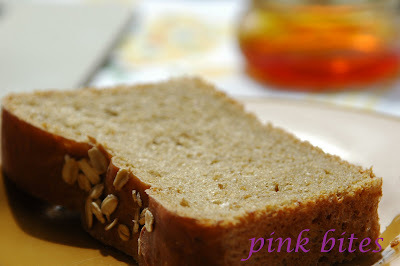 Bread is one of those things that for the most part I preffer to buy it than make it at home. 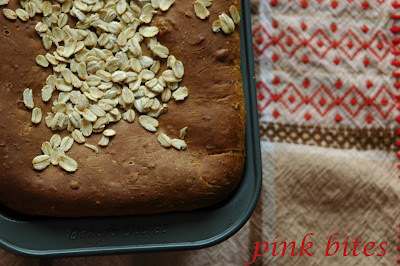 This loaf is one of the few exceptions, it's made with oats and molasses which gives the bread a nice flavour and this dark colour. It is easy to make and tastes realy good. 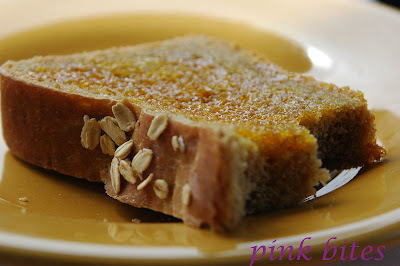 It's a good bread for sandwiches and toast, but most of the time I have it just plain with some saffron honey on top. Bring water to a boil and pour over oats. Add butter and molasses and let mixture cool to warm. Add 3 cups of the flour and the salt. In the bow of a stand mixer, dissolve the yeast in the warm oats mixture and wait 5 minutes. Knead on low speed with the hook attachment. Add remaining flour as needed for the dough to come away from the sides of the bowl after a few minutes of kneading (I use normally between 5 1/2 to 6 cups of flour, but it varies each time). Knead until the dough is smooth and elastic, 5-7 minutes. Remove the dough from the bowl. Form the dough into a ball and transfer it to lightly oiled bowl. Cover with plastic wrap and let it rise in a warm, draft-free place until it doubles in volume, about 1 hour. Butter 2 (9x5 inch/23x13 cm) loaf pans. Punch down the dough and transfer it to a floured work surface (it may be sticky). Cut it in half. Form an oval log with each half (by rolling and sealing the dough). Place the logs seam side down in the prepared loaf pans. Press on them to flatten them evenly into the pans. Cover loosely with a kitchen towel and let it rise again in a warm, draft-free place until doubled, about 45-60 minutes. 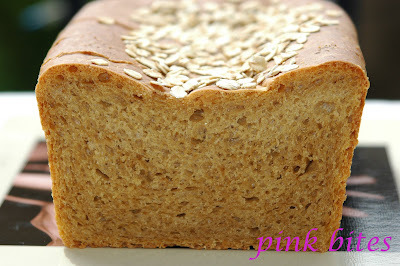 Preheat oven to 375 degrees F. Mist the tops of the loafs with water and sprinkle with extra oats. Bake until golden brown. Bread should sound hollow when tapped on top, 40-45 minutes. Let them cool completely on wire racks before slicing.